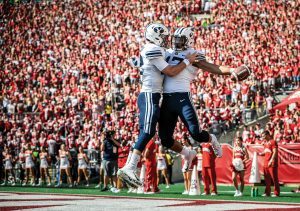 After a disappointing 4-9 2017 season, the BYU football team turned things around in 2018 with two early road victories against Power Five opponents, including a national-spotlight-stealing win over No. 6 Wisconsin. “BYU pulled off the season’s best upset so far in shocking Wisconsin,” Sports Illustrated tweeted about the win. That game featured stout line play, 40-plus-yard runs from running back Bryant P. “Squally” Canada (’18), and even a double-pass TD from receiver Aleva V. Hifo (’20) to tight end F. Moroni Laulu-Pututau (’19), above with ball.